While Bhutan has enjoyed robust economic growth, poverty reduction remains a priority. Serious challenges to the constitutional commitment to universal health care exist, from rising costs to poor knowledge of reproductive health, especially among young people. 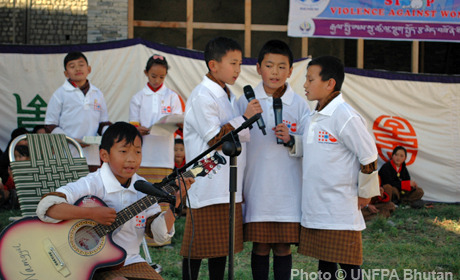 UNFPA has supported the integration of family planning in the health care system since it began operating in Bhutan in 1974. Today, under an expanded programme addressing overall population and development, it helps deliver comprehensive reproductive health care services, including for adolescents, and advocates for incorporating gender equality into key development frameworks.